Hotel-Online » News » Airbnb Pricing: What’s the Reason for Discrepancies? Airbnb Pricing: What’s the Reason for Discrepancies? 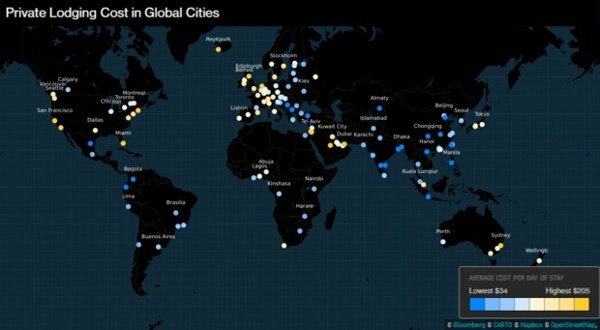 Bloomberg recently released the latest edition of its index which ranks locations around the world – taking into consideration some 120 cities – according to rates charged by Airbnb. Among its main findings were that although Miami and Boston took the top two places for the second year running regarding Airbnb pricing, Middle East destinations are now some of the most expensive in the world, with locations such as Tel Aviv, Dubai, Jerusalem, Riyadh and Kuwait City among the top 15. But how reliable are the data? According to EHL assistant marketing professor Elisa Chan, there is a challenge in understanding how Airbnb sets its prices. According to the Bloomberg article, Airbnb ADR figures for Tel Aviv ($87) and Jerusalem ($82) are far lower than Bloomberg’s figures at $188 and $173 per night respectively. The article points out that Airbnb uses a different methodology to that of Bloomberg, as it includes the rates of units actually booked rather than advertised rates on the Airbnb site. The article cites industry analysts who suggest that Airbnb pricing in cities such as Dubai and Tel Aviv may be largely due to high hotel rates and the high cost of housing, with short-term rentals being pushed higher by owners wanting a premium over what they could earn renting out their properties for a year. Dr Elisa Chan is an Assistant Professor of Marketing at EHL, teaching courses on the bachelor's, master's and advanced certificate programs. Prior to joining EHL, Elisa was Project Officer at the Center for Hospitality and Real Estate Research at the Chinese University of Hong Kong where she oversaw research projects with various companies in the hospitality industry. She was also involved in the Center’s executive training programs for various international hotel brands in collaboration with Universities in China and the United States. While she was pursuing her Ph.D. at Cornell University, Elisa was involved in a number of projects with industry partners on a variety of topics including employee wellness, hospitality data management and data mining, and mobile applications adoption in hotels. Restaurant Staff: To Tip or Not to Tip?